Two great albums from Ray "funky trumpet" Davies – not the lead singer of The Kinks, but a heck of a groovy British bandleader from the 70s! First up is an album of Themes From The Exorcist and other films – all familiar movie themes from the early 70s, penned by artists like Michel Legrand and Lalo Schifrin – but served up here by Ray's Button Down Brass in a very cool style – compressed funk, ala the best crime/cop modes of the time – but with lots of individual touches that make the songs very different than the original versions! Titles include "Point Blank", "Enter The Dragon", "Klute", "French Connection", "Tubular Bells", "Cops & Robbers", and "Beyond Tomorrow". 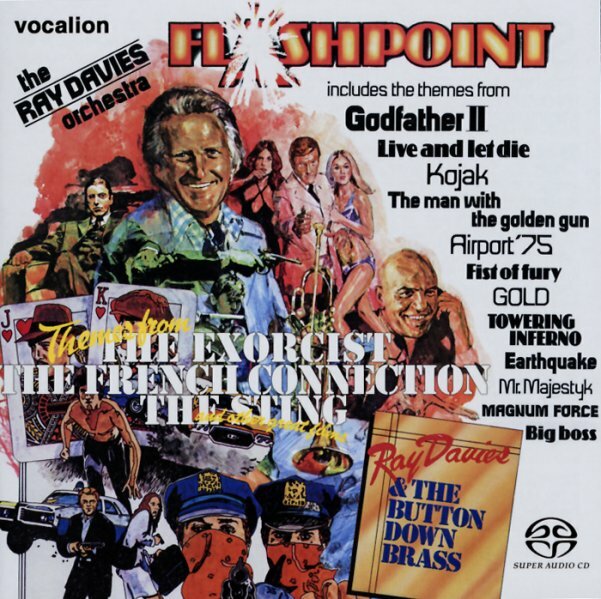 Flashpoint continues with some great film themes again served up in the magic Ray Davies mode – a funky big band approach that makes the record every bit as compelling as the American Cop Shows album from Henry Mancini – but maybe groovier, too. Titles include "Kojak", "Big Boss", "Man With The Golden Gun", "Mr Majestyk", "Magnum Force", "Fist Of Fury", and "Airport 1975". © 1996-2019, Dusty Groove, Inc.